I had no inspiration for a blog post today so I thought that I would share with you what I am currently loving as it has been a while since I last did a current favs! Something are still the same as last time I did this post but I have been trying out a new foundation and brush and they have been included in this so I will let you all know my opinion. I hope you enjoy this post and maybe it will persuade you to buy something new! 1. 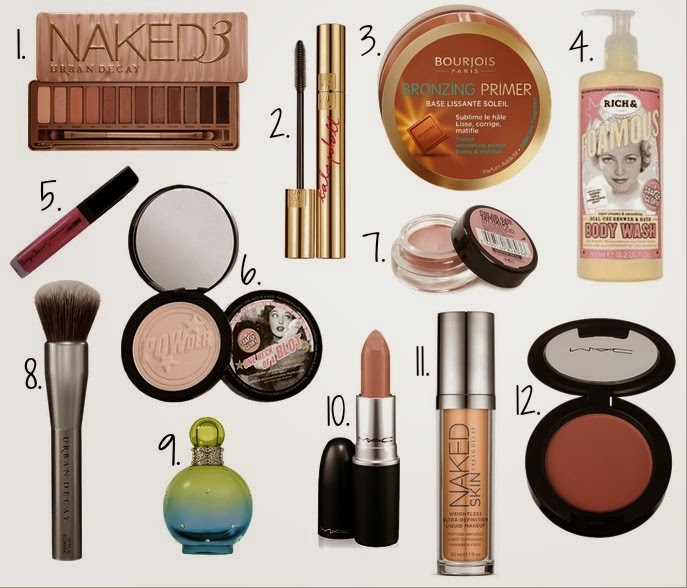 As always I had to include the Naked 3 Palette in my favourites, as this is the best thing I own! The range of colours is fantastic and the blend-ability of these shadows is perfect for creating all kind of looks, one thing I would say is that there are more brown shades whereas the Naked 2 is more greys and blacks! 2. Baby Doll mascara from YSL has been my go to mascara recently, I bought it because in Debenhams it had £5 off and I wanted to try it and I can tell you I'm not disappointed! It is incredibly good at lengthening the lashes as well as adding a bit of volume, it doesn't give my lashes that much volume but I am blessed with insanely voluminous lashes so any mascara works for me! However, my sister bought this too and she has always had problems finding a good mascara but she has been loving this product too! 3. I have been loving this bronzing primer at the moment, as it is getting warmer and I like my skin to have more of a glow so this is perfect under my foundation to do just that! If applied under your foundation it just gives a glow to your skin which then shows through your foundation and adds a slight tan to your face. I have been using this so much recently and I am loving it, I can see it being a staple in my summer make-up bag! 4. A lot of you will know Zoe Sugg but after watching one of her favourite videos where she talked about this shower gel I had to go out and buy it and I have been loving it ever since. It smells divine, if you like a sweet scent then you will love this as it smells like cake batter and I love using this and the same body lotion before I go to bed! 5. As always Tanya Burr's lip glosses are in my favourites but this time I have been loving a different colour, it is called Smile, Dream, Sparkle, it is the perfect pink sparkly lip gloss that can be worn by itself or over a lipstick. The combination that I have been wearing a lot recently is Pink Nouveau lipstick by MAC with this over the top and it is beautiful! 6. If you follow me on twitter or have read my matte powder post then you will know that I haven't been getting on with Rimmel Stay Matte recently so I have been trying other out! I was recommend 'One Heck of a Blot' by a fellow blogger called Kal from Cluttered Closet and I went straight out and bought it, I am so glad I did! This is the best drug store powder I have tried in a long time, it lasts such a long time and I can go all day without topping it up! 7. This Colour Tattoo has been in my collection for a long time as I keep re-purchasing it, it is in the colour Pink Gold! As I have quite oily eyelids I always have to wear a primer and a base of some description and I have used this for as long as I can remember. I always tend to go for a brown and pink eye so this is perfect as a cream base for me to then work the shadows on top of! 8. When I bought my Urban Decay set a few days ago a mini one of these brushes came in the set and I've used it to apply my new foundation and it works really well. The lady said that as the brush is really dense it gives a more flawless and even coverage on the face which I completely agree with as I have been loving the application so far! I may have to invest in the full size one though as the mini one is really hard to hold onto as it doesn't have much of a handle. 9. I don't know about you guys but I like to have a perfume that I only wear in spring and summer and for me it is Island Fantasy by Britney Spears. It is such a light and summery smell to me that I can't wear it in winter without feeling weird and I always associate it with spring and summer now! 10. I recently bought this MAC lipstick whilst shopping in Bath, I did a blog post here! The colour I bought was Coral Bliss, this was also the lipstick that I giveaway for my 6 months blog birthday! It is a really amazing coral/orange colour, now if you are into orange but not the bright lipsticks then this could be perfect for you because it is a slightly more muted orange! I love wearing this in the day time more than the evening because I am more daring with my choices for a night out! 11. Again this is another purchase from Bath, I had been wanting a new light weight foundation for spring and summer because my skin has been quite clear recently and it tends to stay that way throughout the upcoming seasons, so I thought that I would make the most of it. I bought the Naked Skin foundation and I have been wearing it for the past few days since I got it and I really am liking it, although it is definitely light to medium coverage and you do have to put moisturiser on beforehand otherwise it just sticks to the dry patches! If you have good skin or you want to enhance your natural skin then this is definitely the foundation for you! 12. Lastly I have still been loving the MAC blush in the colour Fleur Power, it is the perfect muted pink colour which is brilliant for wearing everyday like I do! You can build it up if you want more of a pigmented colour or it can be applied lightly if you don't want to much. I also find this blusher to look quite natural like a flushed cheek, so if you are going for the natural look then this is perfect, even more so with the Naked Skin foundation!